"This retreat, quite simply, made my younger dreams now seem possible in a more mature context.The biggest takeaway was just knowing there is a community of people who love writing and who will support writers along any stage of their journey. I see the road now, and…I see that I can tackle 7,000 miles one mile at a time." 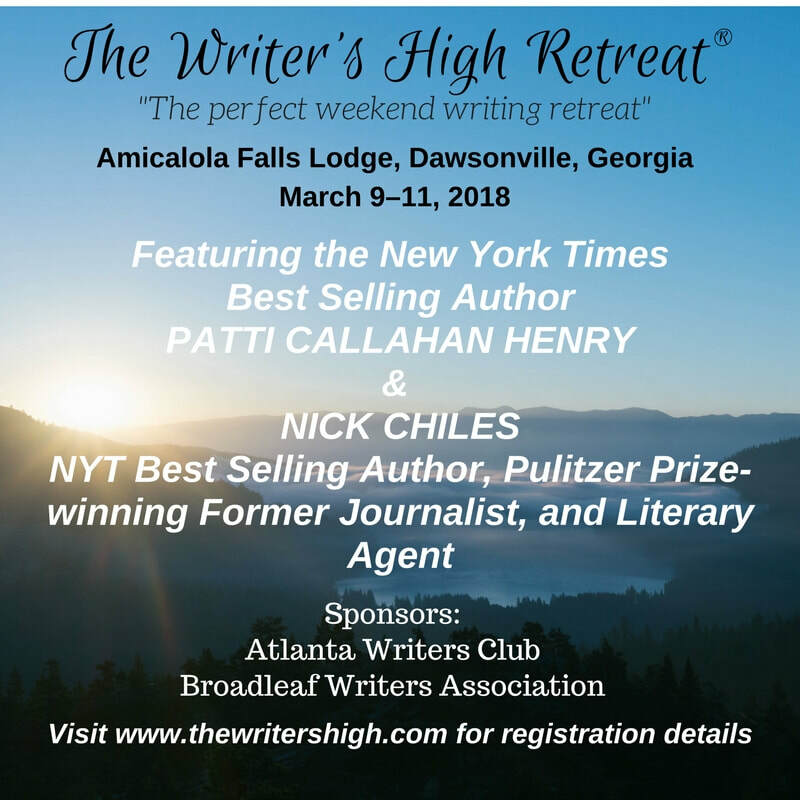 Patti Callahan Henry, the New York Times best-selling author of 12 novels, is the keynote speaker for the fourth annual Writer’s High Retreat® March 9–11 at Amicalola Falls Lodge in Dawsonville, Georgia. Ms. Henry’s latest book is The Bookshop at Water’s End, which was released in July. Her work has received numerous awards, including a Townsend Prize for Fiction finalist, an Indie Next Pick, an OKRA pick, and a multiple nominee for the Southern Independent Booksellers Alliance (SIBA) Novel of the Year. Joining Ms. Henry is Nick Chiles, a New York Times bestselling author, Pulitzer Prize-winning former journalist, and literary agent. Mr. Chiles’ extensive body of work includes the New York Times bestselling memoir Every Little Step: My Story, which he co-authored with Bobby Brown in 2016, and Justice While Black: Helping African-American Families Navigate and Survive the Criminal Justice System, which he co-authored with attorney Robbin Shipp in 2014. The book was an NAACP Image Awards finalist in 2015. Mr. Chiles is also a literary agent with Aevitas Creative Management. The featured speakers are accomplished authors, well versed in fiction, narrative nonfiction, and memoir––and recognized for their warm, engaging personalities and willingness to share their wisdom with others. The Writer’s High Retreat® at Amicalola Falls Lodge package includes two nights’ accommodations, all retreat presentations, workshops, and events; meals included are Friday and Saturday dinner buffet, lunch buffet Saturday, and breakfast buffet Saturday and Sunday (cost includes coffee, tea, and iced tea). Rates are $733/single and $579/double (per person). Prices include all taxes and gratuities. This is a small, intimate retreat, and space is very limited. To register or for more information, visit the retreat website at www.thewritershighretreat.com. Registration ends February 28, 2018. There’s a powerful alchemy that occurs when writers come together in a gorgeous, peaceful setting and are given the time, inspiration, and support they need to breathe life into their writing––it’s called the writer’s high®. The Writer’s High Retreat is designed to develop and rejuvenate writers at all stages in their journey, and retreat guests rave about their experiences. “Like the standing ovation showed… people who articulated something important that not all writers’ groups, conferences, and retreats convey––that no matter where you are on your writer's journey, your writing does matter, it deserves love and support, and it warrants hard work, positive but firm critiques, and a roadmap to publishing,” was how one retreat guest described his experience. Patti Callahan Henry is the New York Times bestselling author of Between the Tides; Where the River Runs; When Light Breaks; The Art of Keeping Secrets; Driftwood Summer; The Perfect Love Song: A Holiday Story; Coming up for Air; And Then I Found You; The Stories We Tell; The Idea of Love, The Bookshop at Water’s End, and the upcoming historical fiction Becoming Mrs. Lewis, the improbable love story of C. S. Lewis and Joy Davidman. A finalist in the Townsend Prize for Fiction, an Indie Next Pick, an OKRA pick, and a multiple nominee for the Southern Independent Booksellers Alliance (SIBA) Novel of the Year, Patti’s work is published in nine languages. Her articles and essays have appeared in Southern Living, SKIRT, Writer’s Digest, Birmingham Magazine, Portico, numerous anthologies, and more. Patti is a frequent speaker at conferences, luncheons, book clubs, and women’s groups. The Writer’s High Retreat is presented by The Writer's High®, LLC, which provides professional writing and editing services for authors and corporate clients. The retreat is sponsored by the Atlanta Writers Club and Broadleaf Writers Association. *Prices include all taxes and tips. Space is very limited.